This study evaluates how statistical and dynamical downscaling models as well as combined approach perform in retrieving the space–time variability of near-surface temperature and rainfall, as well as their extremes, over the whole Mediterranean region. 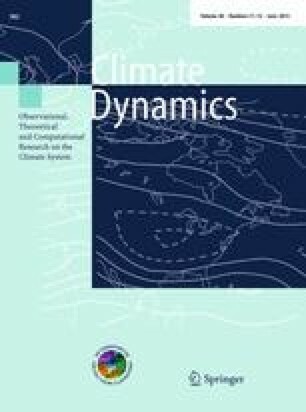 The dynamical downscaling model used in this study is the Weather Research and Forecasting (WRF) model with varying land-surface models and resolutions (20 and 50 km) and the statistical tool is the Cumulative Distribution Function-transform (CDF-t). To achieve a spatially resolved downscaling over the Mediterranean basin, the European Climate Assessment and Dataset (ECA&D) gridded dataset is used for calibration and evaluation of the downscaling models. In the frame of HyMeX and MED-CORDEX international programs, the downscaling is performed on ERA-I reanalysis over the 1989–2008 period. The results show that despite local calibration, CDF-t produces more accurate spatial variability of near-surface temperature and rainfall with respect to ECA&D than WRF which solves the three-dimensional equation of conservation. This first suggests that at 20–50 km resolutions, these three-dimensional processes only weakly contribute to the local value of temperature and precipitation with respect to local one-dimensional processes. Calibration of CDF-t at each individual grid point is thus sufficient to reproduce accurately the spatial pattern. A second explanation is the use of gridded data such as ECA&D which smoothes in part the horizontal variability after data interpolation and damps the added value of dynamical downscaling. This explains partly the absence of added-value of the 2-stage downscaling approach which combines statistical and dynamical downscaling models. The temporal variability of statistically downscaled temperature and rainfall is finally strongly driven by the temporal variability of its forcing (here ERA-Interim or WRF simulations). CDF-t is thus efficient as a bias correction tool but does not show any added-value regarding the time variability of the downscaled field. Finally, the quality of the reference observation dataset is a key issue. Comparison of CDF-t calibrated with ECA&D dataset and WRF simulations to local measurements from weather stations not assimilated in ECA&D, shows that the temporal variability of the downscaled data with respect to the local observations is closer to the local measurements than to ECA&D data. This highlights the strong added-value of dynamical downscaling which improves the temporal variability of the atmospheric dynamics with regard to the driving model. This article highlights the benefits and inconveniences emerging from the use of both downscaling techniques for climate research. Our goal is to contribute to the discussion on the use of downscaling tools to assess the impact of climate change on regional scales. We are thankful to the two anonymous referees who helped to improve the manuscript significantly. We are grateful to Efrat Morin and the Israeli meteorological service for providing the Israeli stations measurements, to Guy Delrieu for providing observations from the French meteorological stations and to the Ev-K2-CNR Committee which provided measurements from the Italian stations, collected within the SHARE project thanks to contributions from the Italian National Research Council and the Italian Ministry of Foreign Affairs. This research has received funding from ANR MEDUP and McSIM and GIS “Climat-Environnement-Société” MORCE-MED projects and from HyMeX program through INSU MISTRALS support. The WRF simulations have been performed at the GENCI (IDRIS) and IPSL computing centers.